News of 150 Years Ago–March/April 1859 « The Turner Brigade--Missouri Volunteers, U.S. The major national news of March and April 1859 was the murder of Philip Barton Key, Washington district attorney and son of Francis Scott Key, by Daniel Sickles, then a New York Congressman. The April trial, in which Sickles was defended by a team of attorneys including Edwin M. Stanton, resulted in Sickles’ acquittal in the first recorded successful plea of temporary insanity. Locally, the big story was the elections in the City of St. Louis. At that time, when the City of St. Louis was still within the boundaries of St. Louis County, both the City offices and the members of the County Court were elected every year, the City offices in April and the County offices in August. In early 1859, the City Charter was amended to provide for two-year terms. Mayor Filley had first been elected Mayor for a one-year term in April 1858 as a Republican. The August 1858 elections had resulted in a majority of the County Court from the pro-slavery faction of the Democratic Party, which was usually referred to as “the Democracy”. 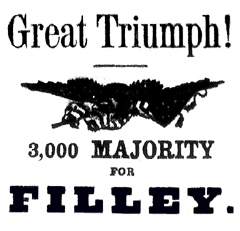 On Monday, April 4, 1859, Mayor Filley was reelected with large plurality of votes in a three-way race. Note that the MISSOURI DEMOCRAT editorial never refers to Filley as a Republican, but as a Free-Soil Democrat. B. Gratz Brown, the editor of the MISSOURI DEMOCRAT until he resigned April 12, 1859, was the cousin of Frank Blair, Jr., the leader of the Republican Party in St. Louis. The “Republican” referred to in the article is the MISSOURI REPUBLICAN, which was the St. Louis newspaper voice of the Democratic Party. In the lead sentence, “thrown down the gage” (which is misspelled in the original) is another way of saying “thrown down the gauntlet”. “Gage” means “pledge”, and a glove was used as a symbol for a pledge to appear at a duel to defend honor. From The Missouri Democrat, Tuesday, April 5, 1859. Thrice, in three consecutive years have the Free-Soil party of St. Louis thrown down the gauge to the slavery propagandists, and thrice have they emerged from the conflict with victory and honor. Yesterday, this noble city repeated her vows of fealty to the great cause of Free Labor by a majority which satisfies every desire of the present, dispels every apprehension of the future, and atones magnanimously for the untoward event of August. The entire Free Democratic ticket has been elected by a plurality of nearly 8000. The triumph of the Emancipationists two years ago, is thus shown to have been no more ebulition of Free Soil sentiment, but the expression of profound though long suppressed conviction. The glory which shed its light on St. Louis then, was no meteor bred of political storms, but the calm reflection of the unchangeable soul light of Freedom. Thrice have we wrestled with the enemy, and thrice has he fallen face downward. Prejudice, ignorance, and corruption; the appliances of the federal, state, and county authorities; the influence of a journal which battens on plunder and trades in lies, and the railroad organizations (victualled as they are by the tax payers of St. Louis,) united in a body to elect their representative man Louis V. Bogy-towards whom we now entertain no feeling but compassion. The tempering of victory with humanity is a leading trait of heroism, and in recollection of this truth we shall say no more of the defeated candidate of the County Court, the Republican and the slavery propagandists…. From The Missouri Democrat, Thursday, March 3, 1859. Murder of P. B. Key by D. E. Sickles. At 2½ o’clock to-day, Mr. Philip Barton Key, the United States Attorney for the District of Columbia, was talking with Mr. Butterworth of New York, at the corner of Pennsylvania avenue and Sixteenth street, near the south entrance to the Executive Mansion, and some twenty yards from the Club-house on President square, when he was accosted by the Hon. D. E. Sickles, of New York. Mr. Sickles charged Mr. Key with destroying the honor of his wife and his own happiness; and, drawing a revolver, instantly shot him down. One ball, entering in at the left side, passed completely through the body of Mr. Key; a second was lodged in his thigh, and a third, glancing, inflicted a slight bruise. 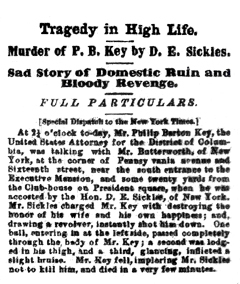 Mr. Key fell, imploring Mr. Sickles not to kill him, and died in a very few minutes….